I've never met a dumpling I didn't like. What's not to love about tender meat and seafood morsels wrapped up in slippery little packages? They're boiled, steamed, fried. Dipped, slurped, sipped. Grab any one of them off a slow moving dim sum cart and you will not be disappointed. 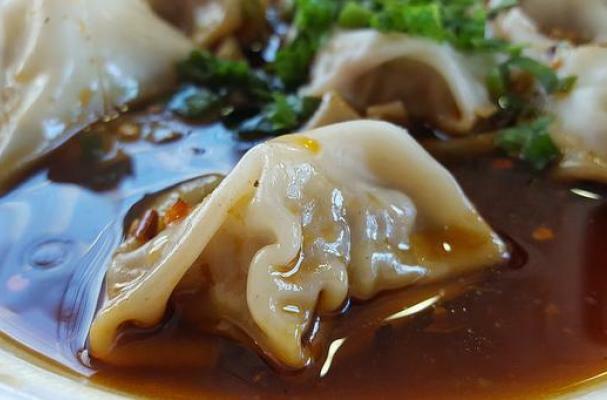 One of my favorite Chinese dumplings are Zhong Shui Jiao, loosely wrapped crescent-shaped dumplings that float in a shallow bath of lip-numbing hot oil. It's the kind of spice that makes you tingle, makes your nose run, but you can still taste your food and your taste buds will remain intact. It's an enjoyable kind of heat, and it's what makes Sichuan cuisine so delectable. The boiled dumplings are filled with a succulent combination of ground pork, shiitake mushrooms, chives, ginger, and ground Sichuan pepper. They're divine in their right, but when bathed in a spiced soy sauce and drizzled with fried shallot oil the stars align and all is right in the world. (This makes a much larger batch than you will need for this recipe. Store the remainder in a jar in your pantry). Combine all concocted soy sauce ingredients in a small saucepan and bringing to a boil, then reduce to a simmer and stir occasionally until it has reduced and become syrupy, about 20 minutes. Allow to cool, then strain into a container and set aside. Put chili flakes, Sichuan pepper and salt in a heat-proof glass pint jar with a tight-fitting lid. Heat oil in a small saucepan over medium-high until it begins to shimmer or when a bit a water sizzles when it hits the oil. Add the shallots to the oil and fry until they are golden brown. Once browned, immediately pour into the jar of chili flakes using a wide-mouthed funnel. Gently stir to mix the ingredients and allow to cool. Once cooled, add the sesame oil and stir to combine. Line a rimmed baking sheet with parchment paper and sprinkle with flour; set aside. In a medium bowl, combine sesame oil, pork, chives, shiitake mushrooms, cornstarch, salt, pepper, Sichuan pepper powder, and ginger and stir to combine. Working with one wrapper at a time, put a tablespoon of pork filling onto a wrapper, fold wrapper in half, seal with water, and pleat into a crescent shape. Transfer each dumpling to the baking sheet and cover with a damp tea towel. Meanwhile, bring a 5-quart pot of water to a boil. Working in batches, boil dumplings until the filling is cooked through, about 8 minutes. Using a slotted spoon, transfer dumplings to a platter or individual serving bowls. Top with the concocted soy sauce and garnish with the Lao Gan Ma Chili Oil and green onions.